Most of my actual library work is centered around instruction. Every semester brings over 200 instruction sessions into our library, of which I usually handle 30 to 40. These are generally freshman composition classes and the name of the game is instruction in research methods. Now, library instruction takes many forms, and there are still quite a few academic libraries that focus their instruction efforts exclusively on database demos, Boolean searching, popular vs. scholarly, and similar aspects of “serious research”. What I like about my library is that we make a concerted effort to break down the artificial division between “The Library” and “The Internet”. Whether it’s activities that send students to Wikipedia or open discussions about the sheer awesomeness of Google, we attempt to engage the students on their own turf and harness their existing internet “literacies” for use in the library and beyond. We show students how to make the most out of Google and library resources both in terms of the technical “where do I click?” sort of skills and in terms of the best times to use different resources. In sum, we teach information literacy, plain and simple. But, wait! Doesn’t that take the wind out of the sails of transliteracy? Are you admitting that ‘transliteracy’ is just a silly buzzword for the same old stuff? 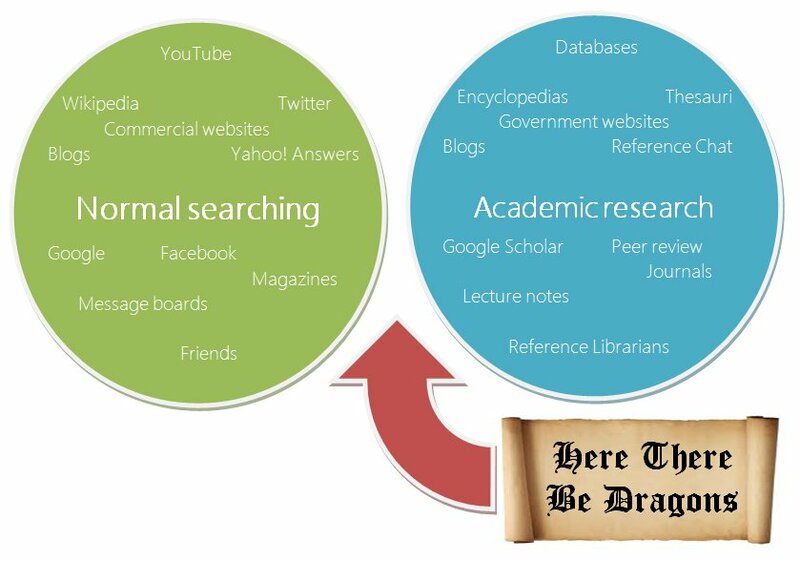 The two spheres…normal and academic…both fall under “information literacy”, so, yeah, transliteracy is information literacy. But, as I see it (again, I’m only speaking for myself) information literacy is often needlessly segmented and compartmentalized. Popular vs. Scholarly. Library vs. Google. Print vs. Digital. You get the picture. Transliteracy comes into play as a pedagogical method, a way to break down the barrier between the student and the library. It encompasses established methods like transfer of learning and analogical reasoning in the library classroom. It’s using Wikipedia to find keywords for a search in CINAHL. It’s reading an academic journal article and then looking up the author’s personal blog for more context. It’s comparing hashtags to subject headings and Amazon reviews to abstracts. In a sense, the real force behind transliteracy is encompassed in one little word in the definition: across. For me, transliteracy is the bridge between isolated spheres of information literacy, it’s about bridging the gaps and showing students that there’s nothing to be afraid of…they already know how to do it. Granted, this sort of approach has been around for a long time. From instruction to reference and beyond, librarians of all stripes are constantly in a teachable moment and many, if not most, librarians already engage in transliteracy (the way I’m approaching it). But the approach hasn’t really had a name yet. With the increasing divergence of our different spheres of information literacies, now is the ideal time to go ahead and give a name to what librarians have been dealing with for a long time. This may be a relatively narrow reading of transliteracy, but it’s what I’m comfortable with. If there’s another word I should be using, let me know. Lane, I like how you’ve approached this and, if I read you right, you mean to suggest that information literacy, at least in academic libraries, is too narrowly applied, especially, in the classroom. I would entirely agree. If the term “transliteracy” can be used as a catalyst for encouraging librarians to expand their understanding of how IL can be applied and taught, than I say let’s use it. In fact, I think you may have shed light on my own misinterpretations. All the activities of TL that you and others here have described, I always assumed those WERE the responsibility of instruction librarians and the need to move beyond the digital walls of library databases was a given. But then, I’ve only been in the field for 2 years and so that current has always been there, moving along the surface, even in the scholarly literature. When I think about specific applications of ACRL’s standards (to name one rubric), you may be right when you suggest that strictly speaking, they rarely encompass anything other than traditional library resources. You’re right, the activities listed are the responsibility of instruction librarians. The segmentation I allude to is on the students’ end, not the librarians’ end. Still, the ACRL standards tell us what to teach, and I’ve got no quarrel there. When it comes to how we hit those standards, that’s where I think transliteracy can be useful. You’re right, I do take a very narrow view of transliteracy as an instructional practice that’s probably reducible to “doing information literacy instruction really well.” But, there are a lot of really good instructional methods and I don’t see why ‘transliteracy’ can’t be used as a placeholder term for just one out of many effective instructional practices for librarians.